It's Passion time again. That season in the year when, as we approach Holy Week and Easter, choirs get geared up to perform music which, for my money, knocks spots off most of what gets aired at Christmas. I still recall my chorister days when, on every day during Holy Week, the printed service books were in a different colour; my personal favourite was the sky blue on Holy Saturday (and why does everyone today refer to it as Easter Saturday which, as any person with a basic understanding of Christian festivals knows, is the Saturday in the week following Easter). 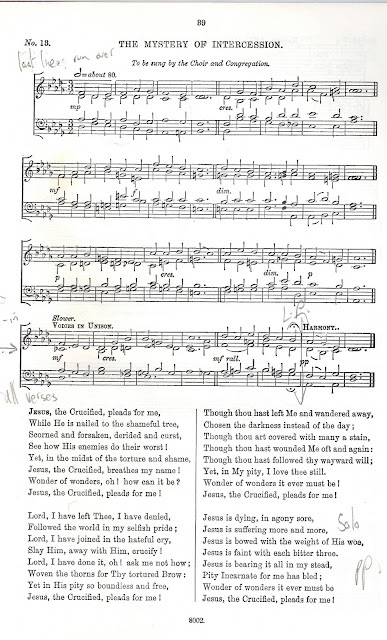 Each day had its own special hymns, psalms and anthems which still take me straight back to my childhood on the very rare occasions when I hear them today. And for years as a church and cathedral organist I relished the once-a-year chance to play Widor's Toccata as a closing voluntary on Easter Day. However, for the vast majority of music lovers, Passiontide and Easter are synonymous with rather more extended musical feasts. I did my MA thesis on one of these, Frank Martin's astounding oratorio Golgotha. 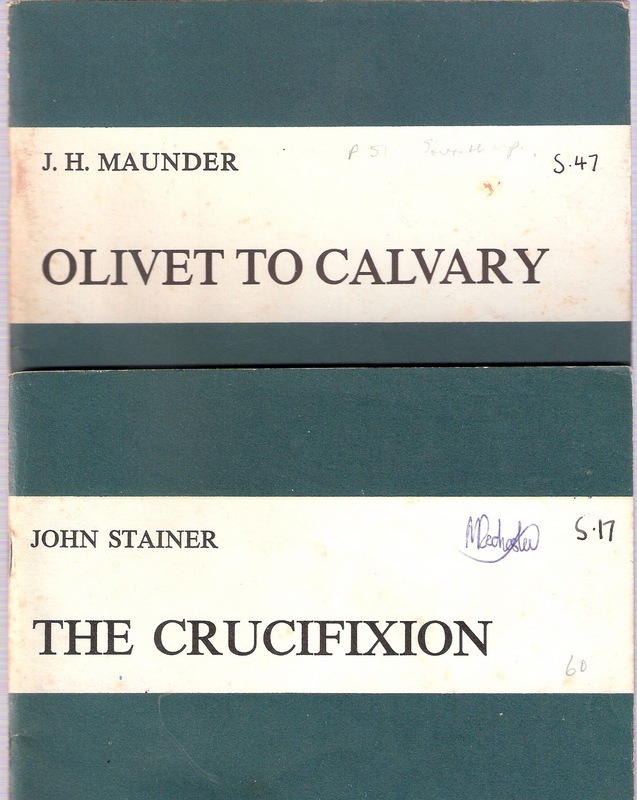 And one which I have always loved and which I performed at some stage during Holy Week whenever I was in charge of a choir is The Crucifixion by John Stainer. 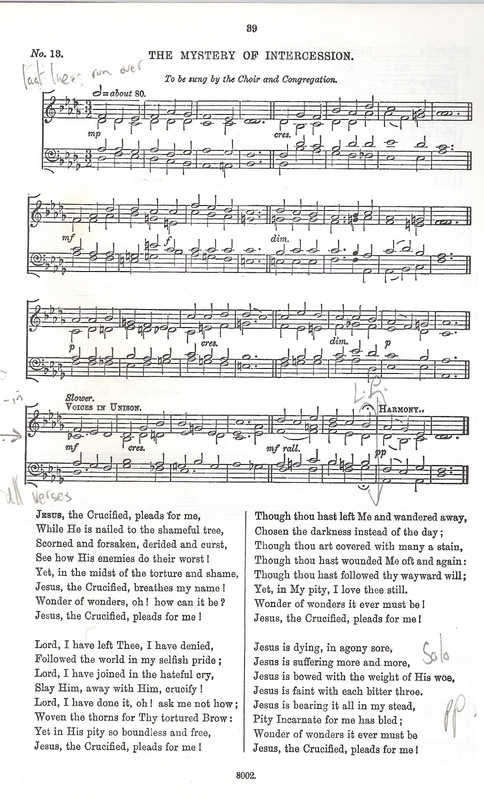 As my father reminded me recently, more than anything else it contains some of the greatest hymn tunes of the 19th century; my personal favourite being the gorgeous "Jesus the Crucified". Amongst many memorable performances I've been involved in over the years, the one which sticks most closely in my memory was in Presteigne Parish Church (in the depths of rural mid-Wales) way back in the late 1970s. A great friend from university, Ian Dollins, who possessed a fantastic bass voice which could wipe the floor with any when it came to the bass solos of Crucifixion, was directing the choir and called in some professionals as the soloists and me as the organist. It was a typical village organ, and when it came to the great climax of the marvellous tenor solo, "Thou art the King! ", the organ quite literally expired. By the music stand was a lead weight on a string which was attached directly to the bellows. This let the player know how much wind was available, and when I saw it shoot upwards, with one hand I manfully pulled it back down. The string broke, and I was left with a lead weight in one hand and a massive dominant 7th to be covered by the other while somehow trying to push back in enough stops to get the wind back into the bellows. The church's organist told me afterwards that she'd never pulled out so many stops and was surprised that some of them still moved! 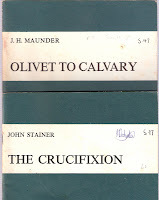 Recalling "Crucifixions we had known and loved" the other day over a pint in a noble London pub with my old friend Peter Almond, he referred to a comment a mutual friend had uttered when he'd heard that Peter liked The Crucifixion. "Hideous Victorian rubbish"! Yes, Stainer was a Victorian – he couldn't help that – and a lot of soulless people dislike the excesses of the Victorian age, but I rather like them and I recognise, as surely does any right-thinking musician, that, while Stainer's work may not rank among the elevated choral masterpieces of Bach and Handel (although I'm not so sure about that) it is a work of true genius - rather akin to Purcell in rising above the appalling limitations of the time - serving its purpose brilliantly and surviving to this day. Get hold of Barry Rose's matchless recording with Guildford Cathedral (the last I knew it was available on a Classics for Pleasure EMI disc 575779-2 coupled with that other great piece of Victorian Holy Week music, Maunder's Olivet to Calvary) and you'll surely agree with me. You could argue that if Stainer was a "hideous Victorian", Bach was a "hideous Hanoverian", but somehow musical snobbery allows us to belittle the achievements of one age (and nation) while elevating beyond all reason those of another. I've often challenged those who glibly call Bach "a great composer" to justify the claim. It's one of those truisms which nobody ever thinks to question, yet there are plenty of flaws and failings in his myriad organ chorale preludes and run-of-the-mill cantatas. True, his outbursts of sheer genius were better than almost anyone else's, but when it comes to justifying his claim to greatness, everyone overlooks the vast bulk of his output and cites the Brandenburg Concertos, the B minor Mass and the St Matthew Passion. I can't argue with that; they are unquestionably among the great pillars of Western music. And it's at this time of year that the St Matthew Passion gets its moment of glory; not so much Andy Warhol's "15 minutes of Fame" as Two and a Half Hours of Sublimity. Again, of the innumerable performances in which I've been involved, one in particular remains firmly logged at the front of the memory. Bill Llewellyn was the conductor (and Ian Partridge a stunning Evangelist), and he was hell-bent on rekindling the spirit of Vaughan Williams at the Leith Hill Festival by keeping it slow and weighty. A note came to the chamber organ (me) from the union man in the orchestra – "Slow it down, we can get into overtime" – and I did, with the result that Bill came up with tears in his eyes to thank me for falling so perfectly into his interpretation. Deeply meaningful St Matthew Passions are pretty much a thing of the past now (thankfully); instead we have brisk and light ones, often too brisk and too light to be truly a "Passion". I could level that charge against a new recording which I had for review last week (and you can read my full review in this month's International Record Review – follow the link) but, in every respect, it is so fantastic, I would suggest it stands as one of the very best currently available on disc. I recommended it to get the elusive "Outstanding" tag in IRR (and the editor mercifully obliged) on the strength of the excellence of the music making. But there is much more to it than that. Coming hot on the heels of my last post in which I railed against those who see downloads as replacements for CDs, this proves beyond all doubt that there is, as yet, no proper replacement for the CD. While the sound is magical – as everything from the Dutch label Channel Classics usually is – and the performance – from the Netherlands Bach Society under Jos van Veldhoven – exceptional in its clarity, detail and musical intensity, what makes this really special is the totality of the package. For my review in IRR I was sent just the white-label pre-production review discs, but I have just received the finished product, and all I can say is Wow! It comes in a sumptuous box and comprises two beautifully engraved books, one holding the discs as if they are priceless jewels, the other one of the most lovely pieces of printwork I have ever been privileged to handle. The latter is, to put it simply, mouth-wateringly lavish with stunning images drawn from the collection of the Museum Catharijneconvent in Utrecht, elegant prose, plenty of musical quotations and a really perceptive analytical essay. The only thing lacking is a clear listing of who is performing - it is there but takes a lot of rooting out - and when I say I eventually unearthed most of this information on pages 182 and 183, you get some idea of the extent of the information given in this hard-backed book. The three discs are, themselves, a visual work of art. I wouldn't like to say that this is the ultimate CD, but for its sheer magnificence of sound, performance, documentation, illustrations and general presentation, this is a fitting celebration of a season of the year in which high art reaches its true climax. as we did not find another place to post comments, this article comes closest to the concert you gave yesterday at the Esplanade Concert Hall in Singapore. Thank you very much for the beautiful music and the witty, informative comments about it. We thoroughly enjoyed every minute of the concert. The piece by Mulet (Tu es Petra) was beautiful and showed us the full potential of this beautiful Johannes Klais organ. Thanks again and we hope to hear more soon! Thank you so much for the kind comments. It was a fin recital and I'm so glad you enjoyed it. Please feel free to post your comments direct to the Esplanade - we need to let them know that organ recitals are enjoyed; they don't have enouhg of them and I think they feel they are not popular!